Baby Swim Nappies are a Must While Swimming in Public Pools. When you have a young child or an infant, the ability to keep them dry while swimming is difficult. A regular nappy will get incredibly soggy and won't do you or your child much good once it is wet. Also, most health clubs and public swim places will require you to use Baby Swim Nappies for your child while in their pool. By using Baby Swim Nappies you will be able to keep your child dry even while they are swimming. You will have two choices when it comes to Baby Swim Nappies. You can choose between disposable Baby Swim Nappies and reusable Baby Swim Nappies. The disposable nappies are obviously much faster and easier to deal with. They are similar to a regular nappy, only when they get wet they do not swell up. They are still able to absorb liquids. Their main function however is to retain the solids as that is what public swim area have against regular nappies, or no nappies. It is very costly to clean a pool if human waste is in it. 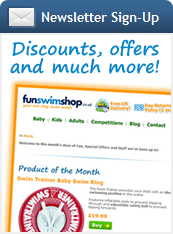 If you choose reusable Baby Swim Nappies you will pay a bit more up front, however they can be used over and over. The way these work is they typically allow liquids to pass through similar to a bathing suit, however solids are kept within the nappy. You can then change the nappy as you normally would, launder it and use again the next time you go to the pool. If you do a lot of swimming this is much better cost wise, however this is more time consuming and not nearly as user friendly as the disposable Baby Swim Nappies. 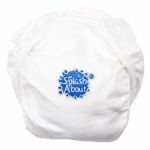 No matter which you choose though, Baby Swim Nappies are a must in all public swim places.